It’s Time to Clean the Gutters! Fall is officially here and it’s time to clean the gutters! Many of us only think about gutter cleaning for our homes. But for all of you commercial buildings out there, it’s just as important to clean out leaves and other debris that can cause drainage issues and ultimately lead to thousands of dollars in water damage. 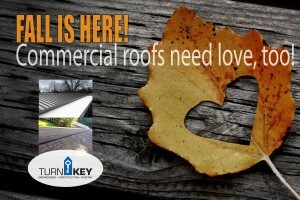 Give Turnkey a call for your FREE INSPECTION & QUOTE! We will have one of our roofing engineers come out to your business property, inspect your roof and property and submit a quote for your review at no obligation to you. Call us TODAY at (404) 799-7902 or email us at customerinfo@turnkeyga.com. Remember, COMMERCIAL BUILDINGS NEED LOVE, TOO so get those gutters and roofing systems cleaned and maintained!